Brief Synopsis – A Midwestern law student gets a summer job working for his uncle in California and ends up getting involved in a local beach volleyball competition. My Take on it – This is a truly terrible film whose general idea seems to have stemmed from the beach volleyball scene in Top Gun (1986). 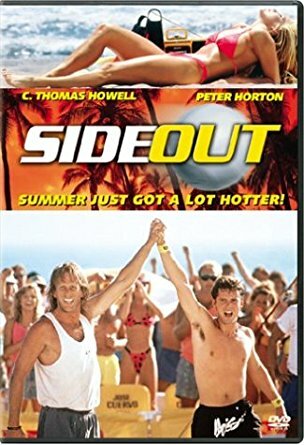 This film appears to have been made in order to try and showcase men playing volleyball without shirts. The cast is fun to watch as they walk around trying to figure out what the actual plot of this film is because so much doesn’t make much sense. It is filled with 80’s staple stars with C. Thomas Howell, Peter Horton and Courtney Thorne-Smith all managing to do very little with what they are given but nothing really gets accomplished. The story itself is really pretty lame and is practically non-existent. This film does have one thing going for it and that’s the great 80’s music that is played throughout. They even use the Kenny Loggins song Playing With the Boys that was made popular by the volleyball scene in Top Gun (1986). Bottom Line – Terrible film that seems like it was made just to show off men playing volleyball without their shirts. It’s quite obvious that this idea was inspired by the volleyball scene in Top Gun (1986). The cast is fun to watch but even with 80’s stars Howell, Horton and Thorne-Smith, nothing gets accomplished. The story itself is nearly nonexistent and besides some good 80’s music, this film has absolutely nothing to offer.